With so many makeup brushes available from various different brands, it can be a bit of a daunting challange to find the right ones. Over the years I’ve grown quite an extensive makeup brush collection, and today I wanted to share my favourite eye brushes with you all. 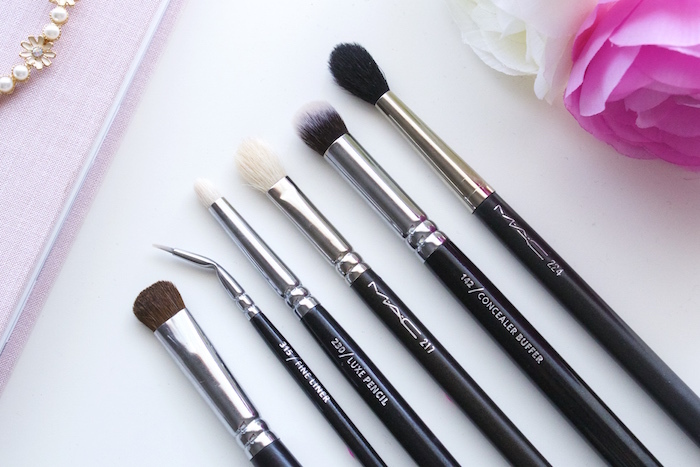 Hopefully you’ll find this helpful if you’re in the market for new brushes! For eye brushes, I tend to stick to the brands I know and love. My eye brush collection is 95% Zoeva, a super affordable yet high quality brush brand. They do various different brush sets, depending on what you’re looking for and how much you want to spend. I’ve got my eyes on the beautiful Rose Gold Complete Eye Set Vol. 2, every time I see it I’m that one step closer to ordering it… resist the temptation Samm! Picking out my favourite brushes was actually harder than I’d expected! I could have included a lot more brushes in this post, but I really had to cut it down to the ones I really can’t be without and use daily. Maybe I’ll get around to posting a part two at some stage. This is the brush I use to add colour to my lids. It’s so affordable at only £2.39, it’s really soft and picks up colour well. I’ve actually got quite a few of these in my brush collection .The only fault I have with this brush is that I wash it had a longer handle. This is the best eye liner brush I’ve ever come across. It’s so small and precise, making it the perfect eye liner brush. The tip is so fine that it makes winged liner that bit easier (will winger liner ever be easy?). You get a much neater line than using a thicker brush, and even with my unsteady hands I can get a presentable looking wing. There’s something about pencil brushes that I adore, whether it’s the cute size of them, or the fact you can do such precise detailing with them… they’re adorable! (yes I’m fully aware I’m talking about a makeup brush, I can’t help it!). I had my eyes on the MAC 219, but as it’s only a pencil brush I thought I’d stick with a more affordable option- although one day MAC 219, you will be mine! The Zoeva Pencil Brush is my favourite for adding shadow and detailing to the lower lashes. If I could only own one eye brush, it would be this! I bought this brush about 3/4 years ago, and it’s still going strong. The 217 is a great brush for various different things – from blending concealer, applying colour to the crease to super precise nose contouring. I use it for adding colour to my crease, it applies and blends colour so beautifully. Priced at £20, it is rather steep but I think this brush is worth every penny. Considering I’ve used it almost daily for the past 4 years, it’s still in a great condition after everything it’s been through! MAC 217, I love you. Although it’s called a concealer buffer brush, that’s not what I actually use this for. When I used to wear my claw/stiletto/deadly long and sharp nails, I found that I couldn’t get my fingers into my cream eyeshadows, yet alone apply them on my eyelid with out almost gauging my eye out! (well, maybe a slight bit extreme Samm). Along came this hero. The Zoeva 142 picks up, applies and blends cream products beautifully. I use this to apply any base to my eyes, and it works great. I put off buying this brush for so long as I just couldn’t justify the £23 price tag. When I got my MAC Pro Card, I caved in and finally bought it with the discount I get. I use this to apply my transition colour, as well blending out crease colours. It buffs out colours really well, and helps soften out any harsh lines helping to give a more seamless look. 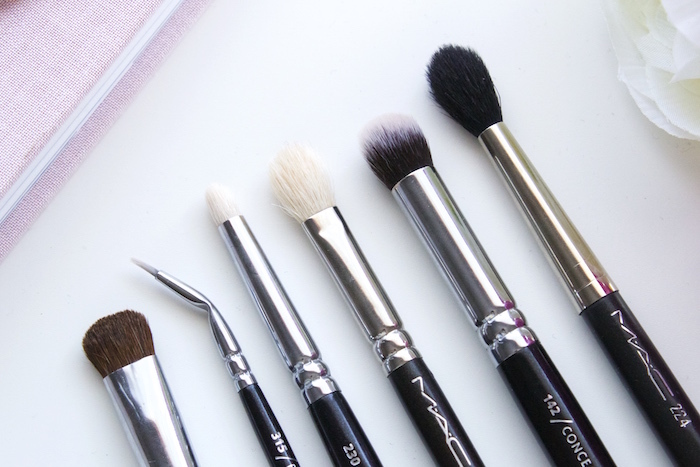 So I hope this post was helpful, or interesting to fellow brush addicts! What are your favourite eye brushes?